Own a piece of...history? 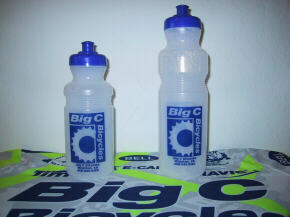 The official Big C Bicycles water bottle! You too can sport the trademark colors of the former Big C Bicycles Cycling Team with this, the bottle of all bottles. Available in 12oz. or the "thirsty guy" 16oz. All Big C Bottles have screw on big mouth spouts. They even have the same slight leak that the team bottles had. So stay cool and stylish with this limited time offer!